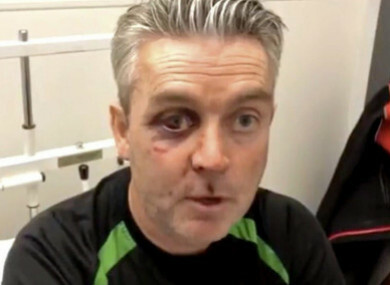 THE FOUR MEN who were arrested in connection with the assault of a soccer referee following a match in Co Offaly earlier this month have been released. The men – two in their 20s, one in his teens and one in his 40s – were arrested yesterday morning on foot of investigations into the incident which took place in Horseleap on Sunday 11 November after a match between Horseleap and Mullingar Town. The 40-year-old underwent a five-hour operation and will spend nearly two months recovering. The four men, who were detained in Mullingar, Tullamore and Birr garda stations, were released in the early hours of this morning and gardaí said files are being prepared for the Director of Public Prosecutions. The FAI handed down 40 year bans to three Mullingar Town players and one supporter last week. The soccer club apologised for the incident, describing it as a “a devastating and disgraceful attack”. Email “Four men released in soccer referee assault investigation”. Feedback on “Four men released in soccer referee assault investigation”.